A lot of gaming kits are currently on the market. A lot of them are cheap but so is the quality, others are good but overpriced. 4gamers tries to find the balance between these 2 aspects. 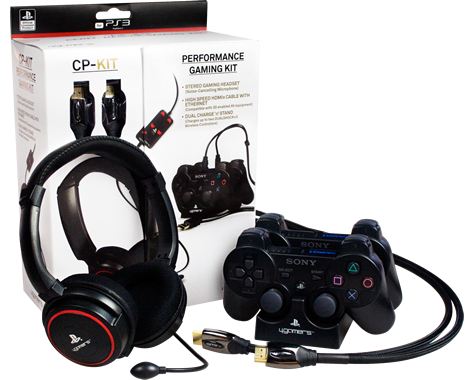 The gaming kit consists out of 3 parts: a stereo gaming headset, a high speed HDMI cable with ethernet and a dual charge stand (2 recharge cables included). Let’s start with the dual charge stand. The concept of the stance is simple, but effective. A little rectangle with reserved spaces for two controllers. Even while the stance is really small, it’s very stable and the 2 controllers fit perfectly in the reserved spaces. The disadvantage is the recharge system itself. You need to insert two mini-usbs in the controllers and plug them into two usb-ports. This doesn’t give you a lot of options to place the stance: near your PS3 or near your pc/laptop. An other disadvantage of using USB ports, is that your PS3 or pc/laptop needs to be powered on to recharge the controllers. The second part of the gaming kit is the high speed HDMI cable with ethernet, which is a very decent HDMI cable compared to other (cheap) HDMI cables on the market. It supports 3D, provides up to a 4K resolution and consists of gold plated connectors. The last (and most interesting) part is the gaming headset. The headset looks pretty basic, but is fabricated out of robust material. Both sound and sound recording deliver a very high quality. The stereo sound is pretty good and even during some chaotic moments in your gaming sessions, the sound quality stays very high. The noise-cancelling microphone does it’s job properly. I didn’t notice any echo during my gaming sessions, and my voice was recorded very clear without any background sounds. The greatest feature of the headset is the Dual Volume Control Unit. This unit gives the user the opportunity to change the volume of in-game sound or chat separately and to mute the microphone. Compared to some other headsets, this unit clearly displays when your micro is muted. This control unit also comes with a disadvantage. It’s pretty heavy for it’s size, so you need to place it on your legs while gaming or attach it to your pants or shirt, otherwise the headset feels too heavy. The headset consists of a 4 meter cable, which is long enough to keep a good distance of your screen. The setup of the cable is a bit messy though. One part needs to be inserted into the USB port and the other into the AV socket of your PS3. This brings a lot of cabling around your PS3. An other disadvantage is that it isn’t so “plug and play” as they tell you on the box. You need to change the sound settings of your PS3 to AV output. This is very annoying when you normally use the HDMI output for sound on your television. This makes you need to change it every time when you want to use your television sound or the headset. Also a warning for users who don’t like a tension around their ears of a headset: I got a light headache after using the headset for about 3 hours because of the tension. Even while mentioning some negative points, this gaming kit is pretty decent for it’s price. The headset delivers very good sound quality and the easy to use control unit is a plus. If you don’t mind some tension on your head of a headset and you don’t switch a lot between AV-output and HDMI-output sound, then this headset is definitely something for you! The high speed HDMI cable and the dual stance (+ recharge cables) are a nice extra. A Fisherman’s Tale – Now Available!